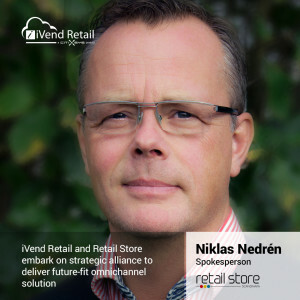 07 April 2016 – Watlington, Oxfordshire, UK – Global omnichannel retail solution brand, iVend Retail, today announced its strategic alliance with Retail Store Scandinavia, one of Sweden’s leading retail systems provider. The partnership will see iVend Retail’s retail management suite combine with Retail Store’s innovative ‘RS Count’ footfall solution, which allows retailers to monitor in-store shopper traffic to optimise conversions and enhance customer experience. By blending shopper traffic insight with iVend’s integrated solution, Retail Store will broaden its offer, enabling it to provide an end-to-end retail system to meet the needs of today’s omnichannel shoppers. With extensive experience in retail integration, consulting and systems development, Retail Store’s ‘RS Count’ solution allows retailers to increase profitability by harnessing insight gleaned from shopper traffic. Through the analysis of footfall, which is integrated into the point of sale technology, retailers can better understand the relationship between staff-to-visitor ratios and in-store conversions. This also means they can effectively drill down into what’s behind each ebb and flow in sales and increase efficiencies in staff planning. The iVend Retail management suite is an integrated solution, which allows retailers to better manage their enterprise operations – across channels, across geographies and across devices. Affording retailers a 360 degree view of the customer – no matter which channel they choose to shop in – combined with a single view of inventory, iVend Retail helps brands redefine omnichannel retailing enabling them to drive greater conversions and deliver the intuitive experiences omnichannel shoppers demand. “With shopper expectations evolving at pace, underpinning the seamless retail experiences consumers now demand with technologies that can grow with you has never been more important. The new solution from Retail Store and iVend will allow retailers to fast track their omnichannel strategies, providing their customers with a consistent experience, regardless of touch point, supported by the appropriate data and applications to drive sales and, ultimately, positively impact the bottom line,” Kolodynski, concluded.